As part of our series Bay Curious, we are answering questions from KQED listeners and readers. This one comes from Maggie Glaize. remember the first time I was confronted by an ominous set of black, blue and green bins. We’ve all been there, looking down at our to-go salad container and realizing in horror that we have no idea which colorful bin is meant to receive the remains of our lunch. If you've been tempted to bypass the green bin for the landfill and recycling options, you're not alone. 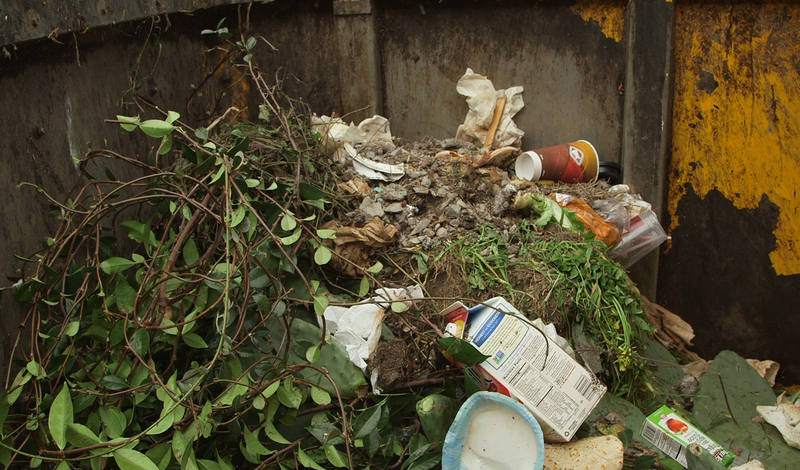 But composting is not just a suggested earth-friendly activity; it's actually mandatory in some cities. For good reason -- nobody wants to add to the 167 million tons of garbage Americans produce each year. In July 2015, Oakland began requiring all residences to have compost bins and contracted Texas-based Waste Management to manage the compost program. I arrived at Waste Management’s East Oakland headquarters at 5 a.m. on a recent Wednesday, searching for an answer to Maggie’s question. Dozens of collection trucks line the parking lot surrounding the Waste Management building while boisterous truck operators, clutching coffee and energy drinks, crowd into the office to pick up their route assignments for the day. By 5:30 a.m., I’m riding shotgun in a collection truck with Amanuel Yemane, a seasoned truck operator and my guide for the morning. Yemane quickly gives me a terminology lesson. “Compost” is the final product in the process of composting. It’s the nutrient-rich soil you buy when you finally plant that urban garden on your fire escape you’ve been dreaming of. “Green waste,” Yemane says, is the stuff in your compost bin (like food scraps, leaves and coffee grounds). Green waste may one day become compost, but only if it undergoes an important decomposition process. The biggest problem with collecting green waste, Yemane explains, is that a lot of people don’t know what is compostable. People often put their green waste inside plastic bags, which cannot be broken down into compost. In fact, later in the process, plastic bags become a huge nuisance for composters -- but we’ll get to that. Another challenge in the collection process: Some green waste is truly gnarly. Occasionally, Yemane will try to empty a green bin on his route, but the food scraps inside will be so congealed and tightly packed that they won’t shake out. Those bins, which often smell particularly foul, are left on the curb for their owner to face. If you put a lot of mushy food scraps in your green bin, try mixing scrap paper in with your green waste. The contents of your shredder, old receipts and post-its all make for great odor and moisture absorption within your bin. After a full morning of green waste collection, truck operators drive to the Davis Street Transfer Station in San Leandro and dump the day’s haul, anywhere from 2 to 6 tons of green waste, onto a huge concrete platform. All of the green waste is loaded into much larger trucks, called transfer trucks, and carted off to Redwood Landfill 45 miles away in Novato. Magic (and chemistry!) really start at the landfill, which despite its name is primarily a composting facility. When the transfer trucks arrive, they dump all the green waste onto an asphalt pad that's larger than a football field. Asphalt doesn't absorb water, which is critical, because compost piles need a lot of water to effectively decompose. Next the green waste is passed through a machine that grinds the materials into smaller bits. Now the green waste is starting to look more like dirt or soil, and less like a heaping pile of leaves, Christmas trees, melon rinds, coffee cups and mysterious lumps of someone's unfinished dinner. But this is where the plastic bags come back to haunt us. When a plastic bag is mixed with green waste, the grinder spits out tiny pieces of plastic that can pollute the air, be accidentally eaten by birds, and otherwise wreak havoc on the environment. So if you take one thing away from this article, remember: No plastic bags in the green bin. The freshly ground materials are then arranged into compost piles, officially called "Covered Aerated Static Piles." A network of pipes pumps air through the pile, keeping alive the microorganisms that decompose the waste. As they eat, these microorganisms create heat, stimulating other thermophilic (heat-loving) microorganisms to come out to bask in the abundance of decomposing green waste. The ceaseless appetite of these microorganisms governs the entire composting process. Alisha McCutcheon, the technical manager at Redwood Landfill, monitors the temperature inside the piles with thermometers she can control from her office several hundred yards away. This phase of composting takes three to four weeks. and the pile's temperature must reach 131 degrees Fahrenheit for three of those days to ensure harmful pathogens, like fly larvae and weed seeds, are killed. 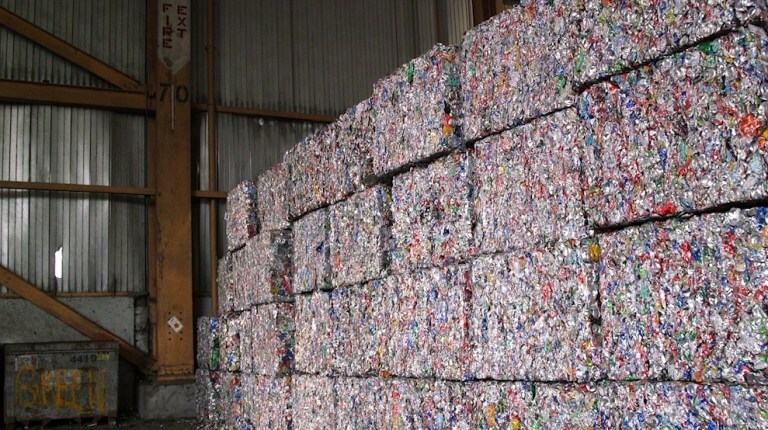 What Happens to San Francisco’s Recycling Once It Leaves the Curb? "Good bacteria," like the microbes that break down fats and proteins, can survive in the warmer temperatures and will continue to help facilitate decomposition throughout the composting process. Next, the compost pile spends two to three months "curing," or cooling down. The curing phase allows fungus to start growing and other "good bacteria" to circulate within the pile. About four months after the green waste left your curb, the compost pile is ready for its final processing. The compost is sifted through a screening machine, which finely combs the material to 3/8 of an inch. Any remaining contaminants, like plastic bits, are removed during this process. The final output is perfectly cured, finely filtered compost. But after all of that, I still didn't really answer Maggie's question: Where does the compost actually end up? Turns out, the compost ends up in more places than you might think. Anyone can go to the Redwood Landfill and purchase bags of compost. Landscaping centers, vineyards and farms all buy the nutrient-rich compost in bulk. Some compost is donated back to the community through community farming programs. 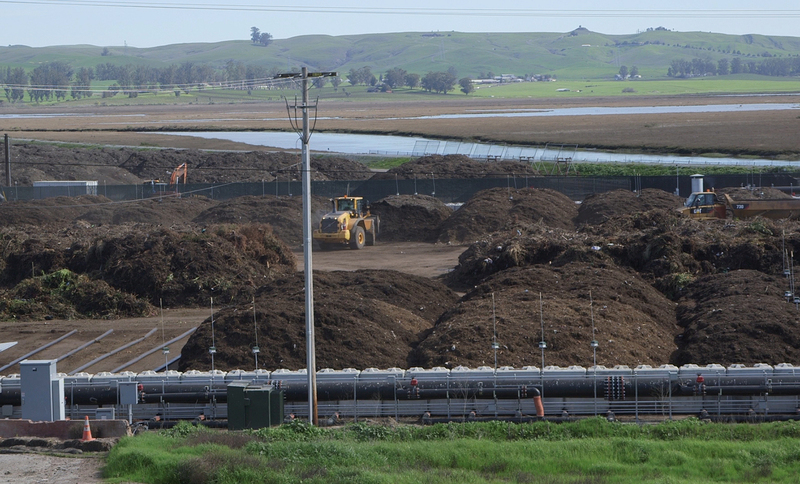 Rebecca Jewell, the recycling program manager at one of Waste Management’s facilities, says the compost produced in the Bay Area largely stays here, circulating back into the economy through the agriculture industry. In essence, the compost ends up in those vegetables you bought at the farmers market, the glass(es) of wine you drank when your grandmother came into town and wanted to "experience Napa" and, possibly, in the urban garden you eventually plant on your fire escape. Got a question you want KQED’s Bay Curious team to investigate? Ask!